The Guest network is an added feature of the Linksys Smart Wi-Fi Routers and Linksys Wi-Fi Routers. Computers or devices connected to the Guest network will have Internet connection but will NOT be able to access the router’s main network and communicate with other devices within the network. 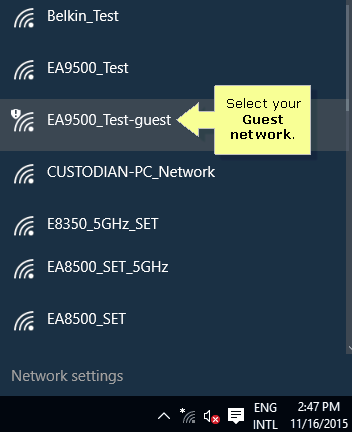 NOTE: The wireless network name (SSID) of the Guest network is the same as the main network but will have a –guest suffix. QUICK TIP: Before proceeding with the steps below, make sure that you have the Guest network's wireless name (SSID) and password. To learn how to check the wireless settings of the Guest network using your Linksys cloud account, click here. If you’re using the Linksys Connect Software, click here. To use the classic web-based setup page instead, click here. 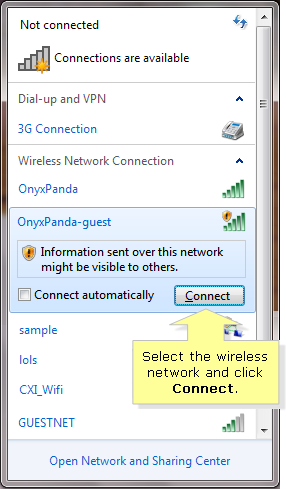 On the system tray, click on the Wireless icon. NOTE: In this example, EA9500_Test-guest is used. 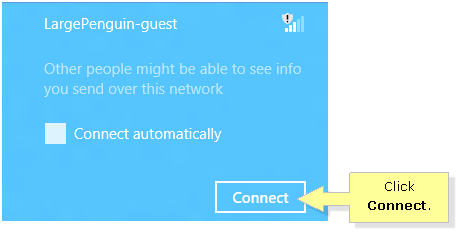 QUICK TIP: You can check the Connect automatically box to enable the computer to connect automatically the next time it is within the range of the Guest network. Select the browser you wish to use, then click OK. 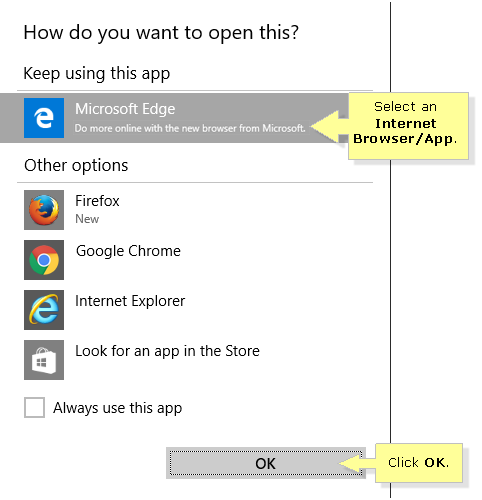 In this example, the Microsoft Edge browser is used. QUICK TIP: Alternatively, you can check Always use this app to enable the computer to automatically use the desired browser the next time you connect to another Guest network. You will be directed to the Guest Access login page. Enter the Guest network password. QUICK TIP: If the Guest Access login page does not appear, there may be a problem with your web browser. To learn more about resolving Guest Access issues, click here. 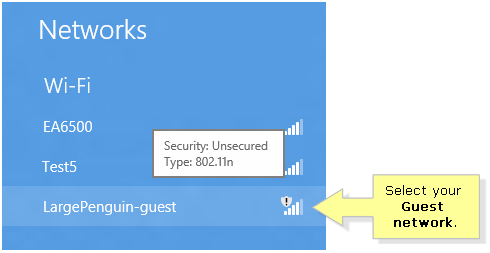 QUICK TIP: If the Guest network name is not displayed on the list, check if the Guest Access Tool of your router is enabled. 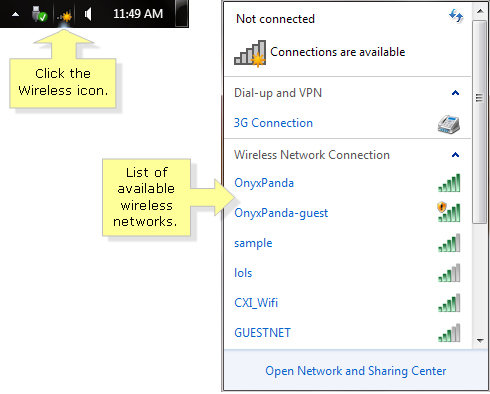 Click the Wireless icon to view the list of available wireless networks. QUICK TIP: If you don’t see your Guest network name on the list, check if the Guest Access Tool of your router is enabled. 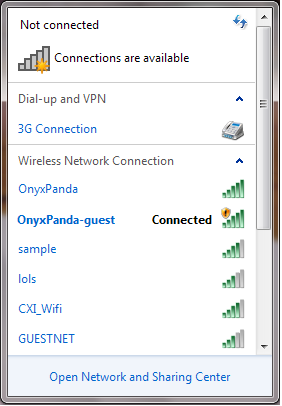 Select the wireless network name (SSID) that has the -guest suffix and click Connect. Open any web browser. You will be directed to the Guest Access login page. Enter the Guest network password. NOTE: Make sure that the Wi-Fi is turned ON. Select your wireless network name (SSID) from the list of available wireless networks. After logging in, you should be able to access the Internet. Do you have mobile devices you want to connect to the Guest network?